Dennis Miller: Here with a commentary is a grumpy old man. Welcome Grumpy Old Man. 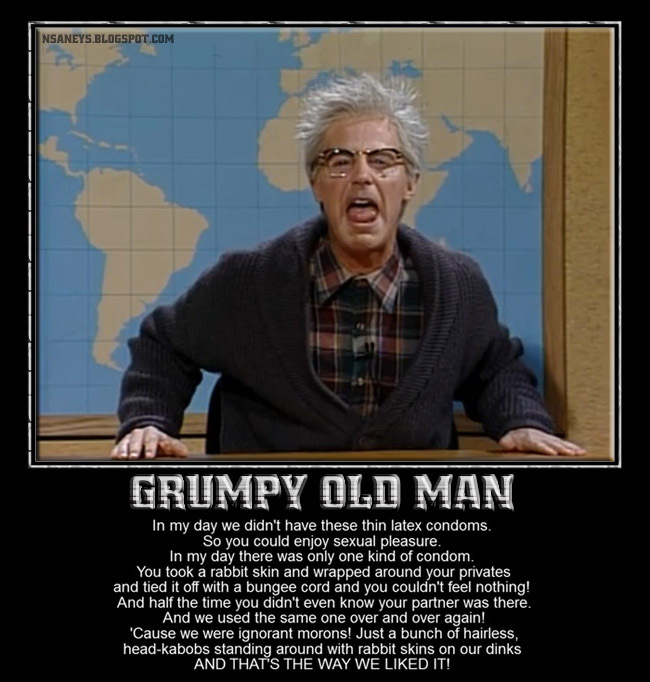 Grumpy Old Man: I'm old and I'm not happy. Everything today is improved and I don't like it. I hate it! In my day we didn't have hair dryers. If you wanted to blow dry your hair you stood outside during a hurricane. Your hair was dry but you had a sharp piece of wood driven clear through your skull and that's the way it was and you liked it! You loved it. Whoopee, I'm a human head-kabob. We didn't have Manoxidol and Hair Wings, in my day if your hair started falling out when you were 16 by 19 you were a bald freak. There was nothing you could do about it. Children would spit at you and nobody would mate with you so you couldn't pass on your disgusting baldness genes. You were a public menace, a crome dome by age 20 and that's the way it was and we liked it! We loved it. Hallelujiah look at me, I'm a bald freak oh happy day! Not like today, everybody feeling good about themselves. I hate it! In my day we didn't have these thin laytex condoms. So you could enjoy sexual pleasure. In my day there was only one kind of condom. You took a rabbit skin and wrapped around your privates and tied it off with a bungee cord and you couldn't feel nothing! And half the time you didn't even know your partner was there. And we used the same one over and over again! 'Cause we were ignorant morons! Just a bunch of hairless, head-kabobs standing around with rabbit skins on our dinks and that's the way we liked it!